I got the kids back to school today. The oldest is in a new school this year so there will be some new friends. 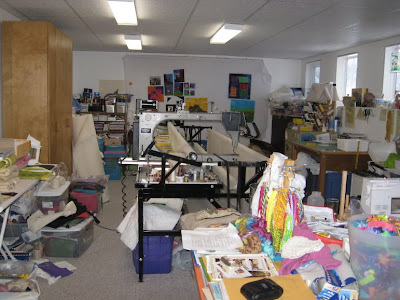 I am back to working at machine quilting in my Studio. I never did stop working, just now I will have more time to get more done again. I tried not to book to much work this summer but there is always more quilts to be quilted than time. Tonight is the first meeting back for the Leduc Quilt Guild , we are called the Black Gold Quilt Patch. I am in a block exchange and still have to do my block for tonight. Our Guild is having a quilt show Oct 17 and 18 at the main High School. My entry forms have to be handed in tonight too. What a studio...I had to look really close to see if there was scrapping stuff...I didn't see any?! Love quilts....great to cuddle with! I will have to show the corner with scrapbooking in it some day soon. I take over the table that is close in the photo.